The well-designed 5,735 square-foot clubhouse is the social hub of Bay Crossing where residents can stay healthy and fit. 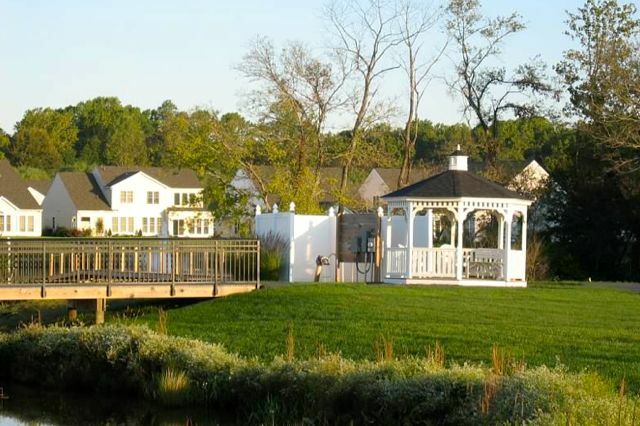 Wooded areas and water features make for a serene landscape at Bay Crossing, an active adult development near Delaware's coast. This close-knit community is located within easy reach of Rehoboth Beach and Lewes, a resort town that caters to history buffs, sea dogs and foodies. Bay Crossing is a smaller development with a total of 256 homes planned upon completion, but it still offers cutting-edge amenities that support an active and healthy lifestyle. A 5,735 square-foot clubhouse contains multipurpose rooms for group activities and classes. Residents regularly meet here for shared interests like bridge and book discussion, or to coordinate travel plans, tennis games and golf outings. A ballroom hosts parties and events throughout the year, while a cozy library is ideal for some relaxing downtime. To help residents stay in shape, a well-appointed fitness center features all of the latest equipment plus an aerobics studio. For those who prefer to stay fit in the great outdoors, a well-maintained outdoor pool is perfect for swimming laps, while several walking trails make their way throughout the community. Tennis and bocce ball courts are situated just outside the clubhouse as well. Next door to the property, the Midway golf course features reasonable rates and a staff PGA professional instructor who works with beginning and seasoned golfers alike. 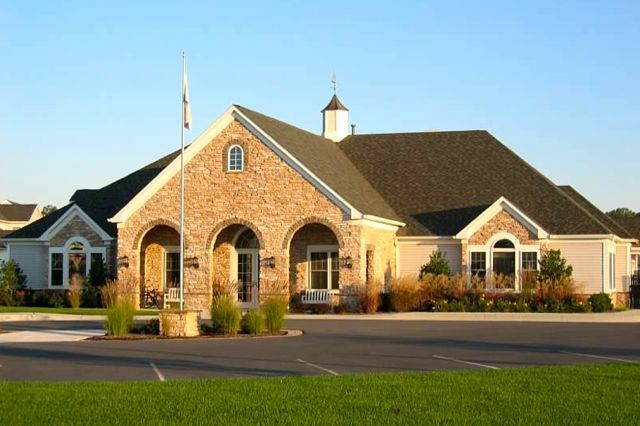 Bay Crossing's men's and ladies' golf clubs play regularly at this course. Pulte Homes broke ground on Bay Crossing in 2005. It was later taken over by Blenheim Homes and features both attached and single-family residences with a variety of floor plans. All homes range in size from about 1,300 to 2,400 square feet. Homebuyers can choose from new and resale models, up to three bedrooms and two baths, and attached garages. Many of the homes have master suites on the first floor. Residents can simply enjoy nature by taking relaxing strolls along the walking trails or pursue activities like tennis and bocce ball. Outside of the community, homeowners will find plenty of activities to fill their social calendars. The town of Lewes is only minutes away, and in addition to quotidian activities like shopping for necessities, it offers a historic district, museums, lighthouse tours, and independently owned restaurants that make the most of locally available seafood. Visitors can also hire charter boats for fishing and coastal tours. Rehoboth Beach is only a short drive away, and the recreational opportunities are seemingly endless. It's home to an award-winning boardwalk, miles of beachfront, art galleries, boutique shops, and many other attractions. Visitors can go kayaking, canoeing and parasailing, and fly kites, which is perfect for when the grandkids are in for a visit. There are several other nature parks in the area, including Cape Henlopen State Park, a haven for bird watchers and other wildlife enthusiasts. The area is even home to the Nassau Valley Vineyards, which is open for tours and wine tastings. Baby Boomers and retirees aged 55 and better who are looking for a resort-style town near the ocean should look no further than Bay Crossing, a small community within easy reach of charming coastal recreation areas and beach towns.